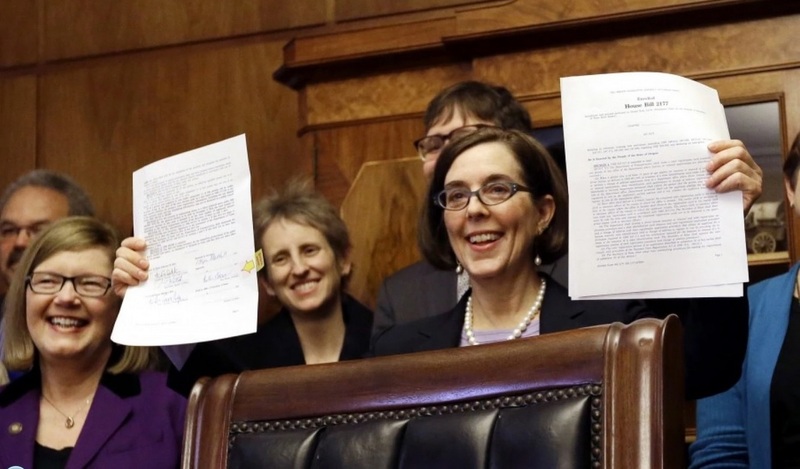 Earlier this week, Oregon’s new automatic registration bill became law with the signature of its longtime champion, Governor (and former Secretary of State) Kate Brown. The law has gotten lots of attention – predominantly from progressives, as in this Plum Line post in the Washington Post from the American Prospect’s Paul Waldman – as a game-changer for elections and a potential model for other states and localities to follow. The “opt out” provision is key to the law. If someone does not want to be signed up, they have 21 days to let the state know. Many other states offer the chance to register to vote when someone renews their license or gets a state identification card, but those citizens have to opt in. We also don’t know how well the state and counties will manage this new data flow; as we’ve seen in other states, such “simple” changes are usually anything but. “It’s likely we’re going to see more people on the voter registration rolls,” McDonald said, noting that some states with same-day registration have seen increases of 3 to 5 percent. One thing that’s for sure is threatening to fine people for not voting, as in Australia, ups your numbers. Still, Maine has a higher percentage of registered voters than Australia. Out of the 1,041,475 people who could be registered there, 989,330 are, according to the Maine secretary of state’s office, and 58 percent of them showed up at the polls in November. And while Alabama has a higher percentage of eligible voters registered than Oregon, its turnout drops in comparison. Turns out more people vote if you mail them their ballot than if they have to go to a polling place and bring IDs. Oregon estimates the bill will add 300,000 new voters to its rolls. According to the state DMV, there are 876,086 more drivers with licenses in the state than registered voters, however, not all of those drivers may be eligible and some may opt out of being registered. Adding 300,000 voters to its rolls would increase the percentage of eligible voters who are registered to 83 percent, higher than Alabama. We won’t have to wait too long to see what the increase in voters means for Oregon since the state has some elections this year, and more in 2016. Of course, the effect on turnout will depend somewhat on your definition of the term. If, like the Fix’s Schwartz, your definition is percentage voting of eligible population, then turnout will likely increase because of the greater number of people voting. If, on the other hand, you look at the percentage voting of registered voters, turnout will likely go DOWN given that the opt-out requirements will probably add proportionally more non-voting than voting registrants. Keep that in mind when people start to debate the impact of the new law. Oregon’s automatic registration increases the likelihood of illegal immigrants being registered by mistake and creates the possibility of duplicate registration for people who change addresses or spell their names differently on their driver’s license than on their voter registration. “I just think it’s a virtual certainty that they will see hundreds of thousands of people mailed two or more ballots, and that can be a very tempting situation where some people may succumb to the temptation to fill out both ballots and vote twice,” Kobach said. Technically, Kobach’s citizenship concern shouldn’t be an issue – the state asks for citizenship information as part of the licensing process at DMV, whose list will be used for registration – but that doesn’t mean the fraud argument won’t get a long and loud airing in Oregon and elsewhere. The Oregon law puts the burden of registering a person to vote on the state rather than on the individual. Kobach said this responsibility should remain with the individual. These views are especially noteworthy given the fact that not one Republican in Oregon’s Legislature voted for the automatic registration bill; if anything goes wrong with the process (including implementation problems or nonexistent/disappointing turnout effects) you can be certain these arguments will get more play. For now, it’s all in the future – but the future of Oregon’s new automatic registration law promises to be one to watch. Be the first to comment on "Oregon’s Automatic Registration is Law: Now What?"